Yilan’s Toucheng Leisure Farm is situated in the mountains facing the ocean. The three rivers streaming through it provide abundant water as well as a natural landscape and rich ecological resources. Here you will see Japanese rhinoceros beetles, Taiwan barbets, common bluebottle butterflies, and fireflies.<br/><br/><br/>With a variety of wild vegetables, such as Brazilian Fireweed and asparagus, and animals, including free-range chickens, Muscovy ducks, boars, and goats, Toucheng Farm is reminiscent of the agricultural country flavor of old.There are also many fruit trees from which you can pick and taste fresh fruit all year round.<br/><br/><br/>The Rice Paddy Culture Area allows you to experience the life of a farmer. Here you can transplant rice seedlings, dry rice, and take part in rice winnowing, threshing, and grinding.The sheep pen and hen house allows visitors to interact with and feed animals up close and collect chicken eggs.Or you can fish for tilapia and carp to fully experience agricultural life and discover many interesting things you will only find in the countryside.<br/><br/><br/>At the farm you can also make DIY crafts, leaf print t-shirts, or recycled bags. 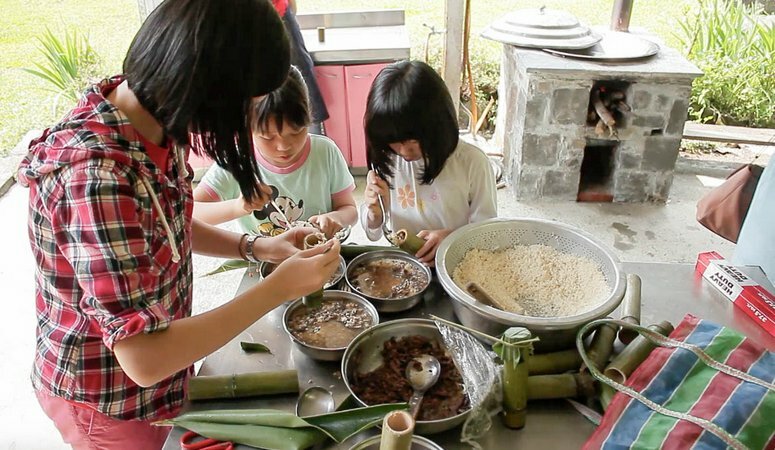 Enjoy the farm’s mung bean soup, rice noodles with taro, sweet tangyuan, taro sweets, Taiwanese noodle soup, shaved ice, and other traditional snacks.